Britain and China signed the first currency swap agreement. Britain was awarded the first RMB RQFII quota outside Asia. Britain issued the first RMB denominated financial products. The issuance of sovereign debt in RMB has accentuated British government’s firm commitment to building London into one of the most dynamic off-shore RMB markets. Second, it created a new milestone of RMB internationalization. After more than three decades of fast growth since reform and opening up, China has surged to be the world’s largest trading nation, second largest economy, and the third largest outbound direct investor. RMB has become the world’s seventh largest payment currency. On the day of issuance, the order book closed with 85 orders totaling 5.8 billion RMB. This fully demonstrates international market’s confidence in RMB and in China’s economic prospect. I believe that as the first major Western country to issue RMB sovereign bond and by taking RMB as one of its reserve currencies, Britain will play an exemplary role in the world. Third, it provided a new driving force for China-UK economic cooperation. This issuance reflected the demand of fast growing economic ties between China and UK. Our bilateral trade hit a record high last year. The first three quarters of this year saw another increase of 20%. This was much higher than the increase of trade between China and the EU. The total trade volume this year is expected to top 80 billion US dollars. In the meantime, Chinese investment in Britain is soaring, with18 billion US dollars in the recent three years. This is more than the total investment in previous three decades. Britain is now the largest recipient of Chinese investment in Europe. 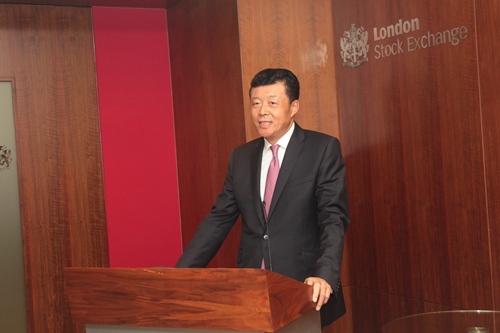 The fast advance of London as an off-shore RMB market will create win-win results, as it will greatly boost China-UK business links and economic ties. It will also deepen our bilateral trade and investment. In conclusion, I wish every success for building off-shore RMB centre in London.